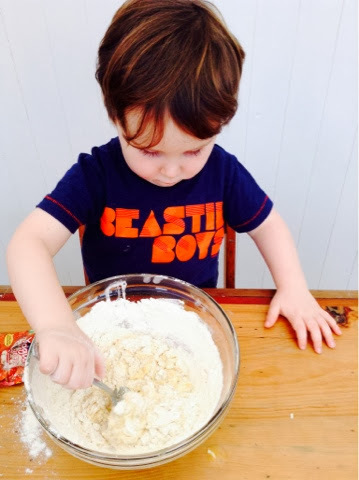 Today we visited my beaut friend Bec's Ivy Cottge to do some toddler friendly baking with her lovely little boy Baxter. I'll be honest I'm not the best of cooks. I can russle up a mean fish finger and waffles. At a push I can do a jacket potato. Bec is fab at all kinds of creative things. 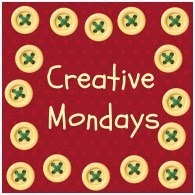 A quality that I am sadly lacking in (she makes lampshades and everything, she's very clever. By rights I should dislike her but I don't). We mixed in 100g of soft marg and 100g of castor sugar. And then popped in two eggs and 100g of self raising flour. Bax cleverly put in his own eggs whilst we were gossiping over tea (some sort of two year old genius that managed not to get any shell in). He also added in a few of his own plastic eggs and Erin somehow inserted a bangle into her mix. 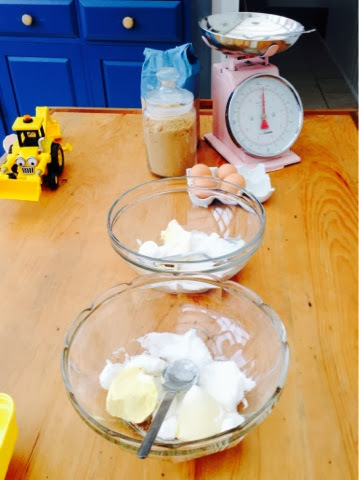 We managed to remove these unhygienic items and the kids got on with the mixing. With a little (but not that much actually) help from us. We then put in 1g of vanilla paste. The kids gave it another stir. And scooped the mix into cupcake cases. 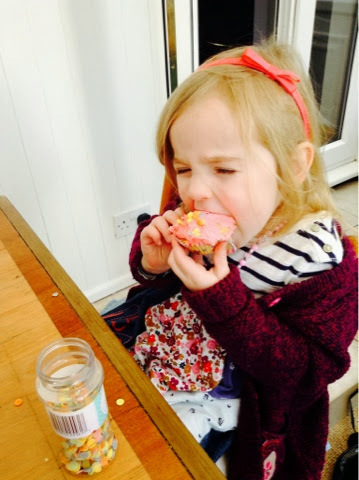 Erin opted for flowery ones and Bax big old muffin ones. Obviously we then all gave the cake mixture a good lick. As it's clearly the best bit of baking. The bowl had to be prised out of Erin's tiny super strength toddler grip. We put the cakes into the oven for 15-20 mins and let the kids fight over more toys whilst we continued with the gossiping. Bec then took them out to cool. 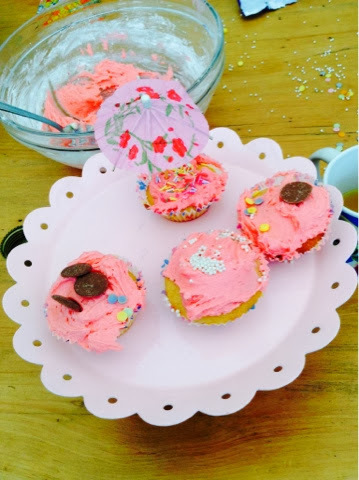 Whilst she mixed the icing (50g of marg, 100g of icing sugar) Erin chose pink food colouring, Bax opted for plain butter cream icing. 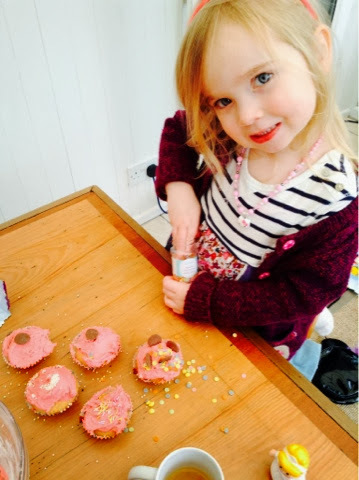 There were lots of sprinkles on offer to decorate the cakes with. As well as chocolate buttons and some little haribos. Bax enjoyed decorating with one hand whilst consuming with the other. I liked his style. To make them look even more exciting Bec got some cocktail umbrellas out and little Easter chicks. The finished product was super. And as I ate three I can confirm they tasted lovely and not at all of dirty bangle or plastic egg! 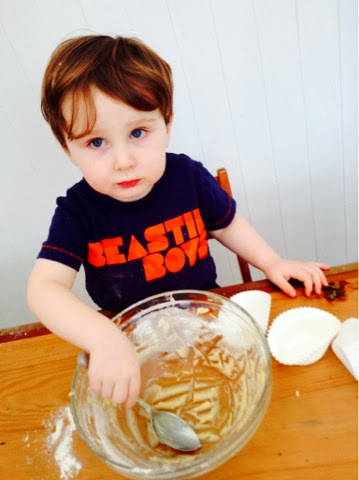 Seeing as both Erin and Bax are still both little it was easy to bake with them. 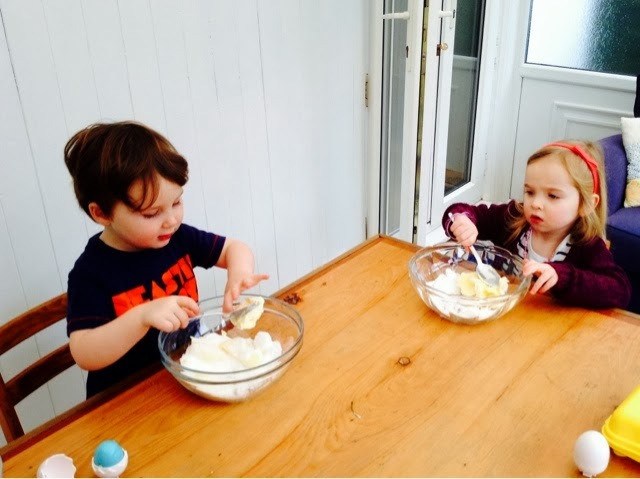 They loved the mixing, with the odd lick of the spoon here and there (there was a minor crisis when both children felt the need to consume raw egg) and really enjoyed the decorating. And you know what?, bar a trail of tiny sprinkles, the mess was minimal. 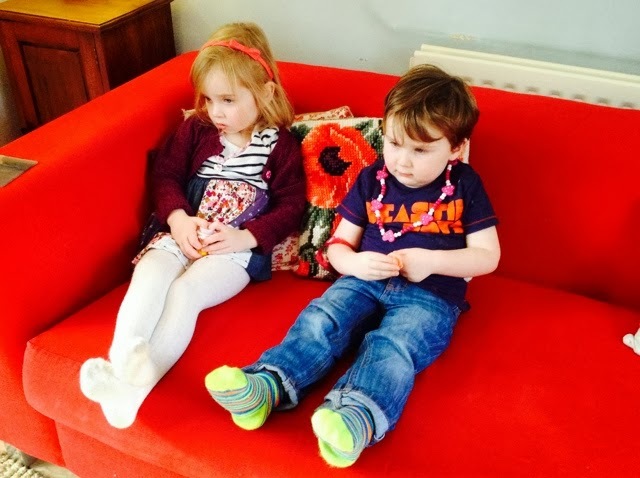 Afterwards they watched a bit of tele and then the sugar kicked in and they screamed at each other for 10 minutes. Good fun had by all! Lucas says - 'Yum, Yum, in my tum!!! LOVE that you've used Haribo - excellent choice of toppings my friends. 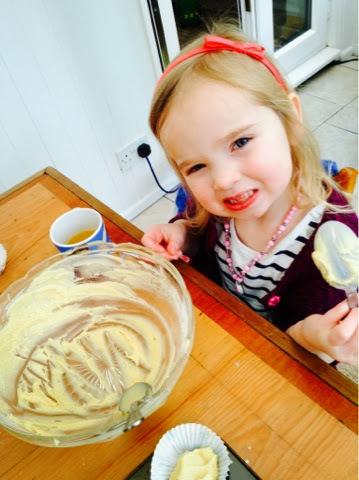 Ah, lots of fun baking with children, they love it. 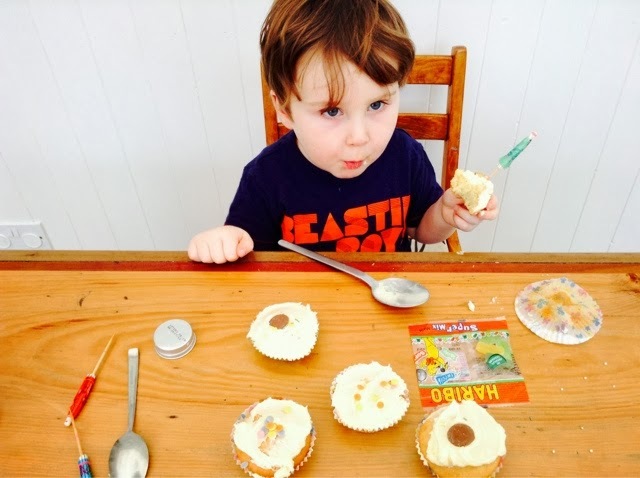 They are awesome little cupcakes - I am very tempted to do the same with Little Z this weekend! Awh that's lovely! I let Little B lick the bowl but that's as far as we've got so far!